After a pleasing Sunday I was glad of the rest day on Monday. Just a gentle 4 miles on Tuesday in preparation for Phoenix 10k on Wednesday evening. The forecast was for wind and rain and as the start time neared there was a massive rainstorm so I got togged up in full on winter waterproofs for the short cycle to the start. Which meant as soon as I exited in the house it stopped raining, the sun came out and it was rather warm so I looked like an utter lunatic in my ski jacket (I’d even re-inserted the fleece lining) with hood, ski gloves and lined waterproof trousers. Once I arrived I shoved it all in the handy mornflake bag I received on Sunday and sauntered over to the other Arenas who were milling about. The sky looked very ominous and the ground was soaked from the recent storm but the conditions were perfect for running. Nary a breeze and not too hot. Following on from my success at Seaford (by success I mean adapting to the wind conditions and sticking to my plan) I wanted to do the same here. Once again the weather wasn’t at all what was forecast so instead of my original plan of going out conservatively into the wind – as there wasn’t any – and pushing it on the way back, I hurriedly assembled a plan B which was to run the first two miles sensibly (also to try and keep calm in the busy ness at the start and not worry about trying to get past people, wasting energy weaving through people etc), then pick it up for the next two, then yet again for the final two. This would make the race almost a carbon copy of a training session I did the Tuesday of the week before. That was it really. I did what I wanted and picked it up after every two miles and it was a much more pleasant (though still unpleasant of course as I was still running) way of running than going out too fast and dying which is what I’ve basically done for the past 8 or so years). 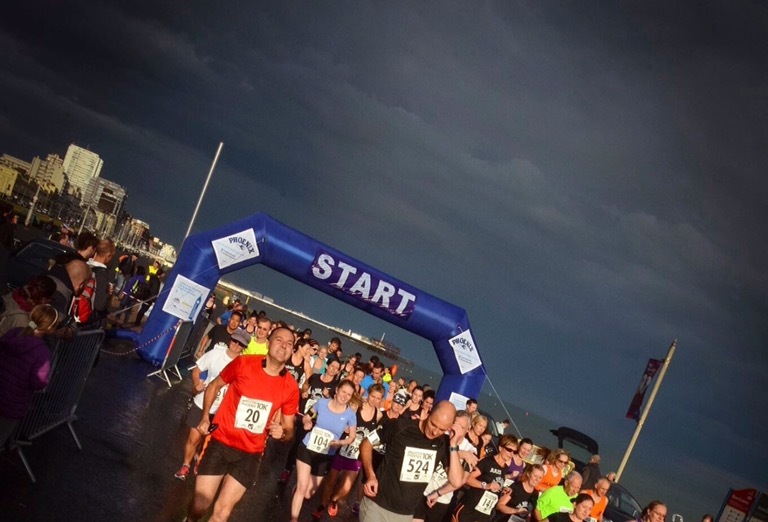 I was pleased with my time of 42.25, a good minute quicker than Seaford and hopefully more to come once I start off a bit more quickly. At the moment I’m concentrating on concentrating and sticking to a plan with no sulking or otherwise disappointing myself. Thus the times will come (fingers crossed). 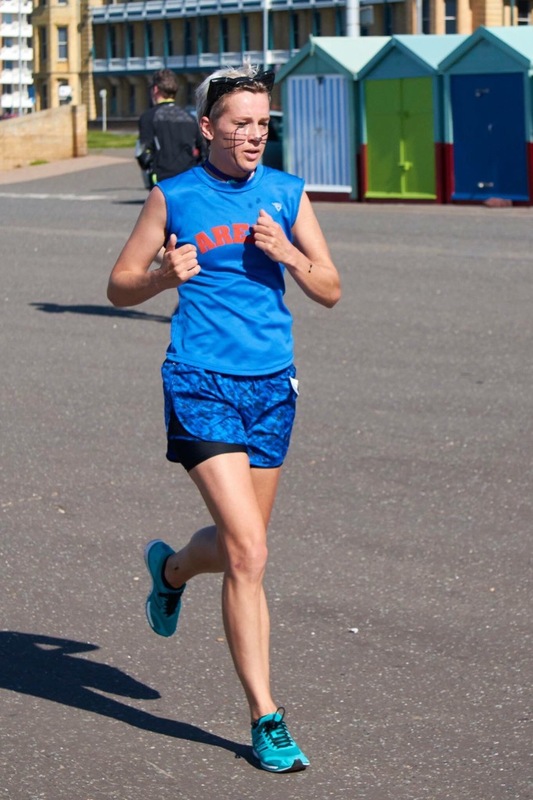 On Thursday I had been set another hard session to practice running on tired legs and mental strength. 90 minutes including through the middle 6, 5, 4, 3, 2, 1 minutes fast (or faster than the rest anyway) with 3 minutes easy in between. I was indeed knackered so was very surprised to find my average pace was 8 minute miling especially as I felt I’d actually ground to a halt after the last fast minute back into the wind (obviously). Friday was a gentle jog. My legs were actually fully knackered. My quads ached! I haven’t done anything proper for so long they haven’t ached for ages. This can only be a good thing though it didn’t feel like it at the time as I dragged them along with me. 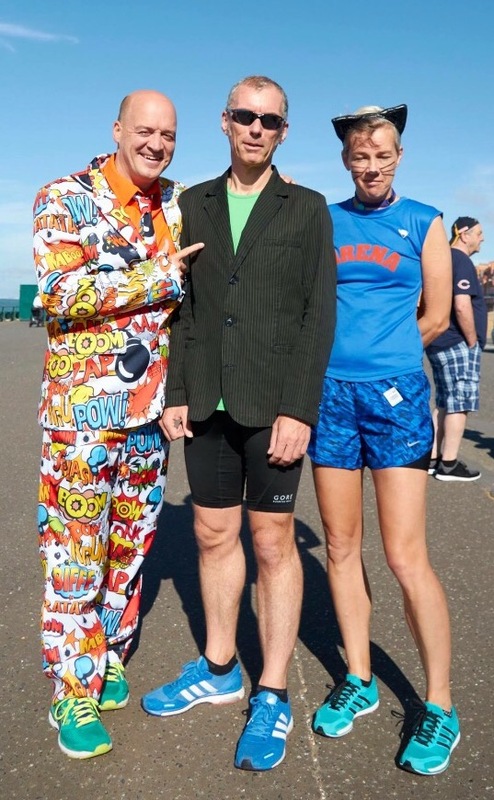 Saturday was Hove Prom parkrun’s first birthday so there was a dress up theme of prom on the prom. It was therefore the hottest day of the year so far. Perfect for three piece suits, blazers and so on. As I only ever put on cat ears, collar and whiskers I would have to do as prom cat. 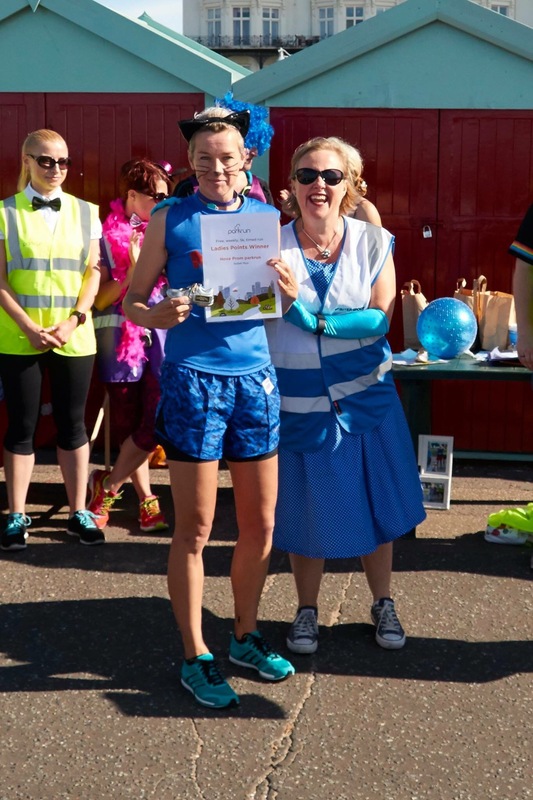 By dint of living close to the prom and it mainly being a visitors’ course I won the ladies points competition. The actual run was a knackered attempt. Just very tired from Sunday, Wednesday and Thursday. 21.48 was perfectly acceptable. This morning (Sunday) was a doomed attempt at my usual hilly run but with 20 minutes at “a good pace” at the end. I had a stitch throughout and was just totally drained from the week’s racing and training so it could at best be described as a hilly run. Nice to have a hot day though even if it didn’t help the running. A pleasing week of around 37 miles, even though I am now thoroughly exhausted and looking forward to a rest day tomorrow.